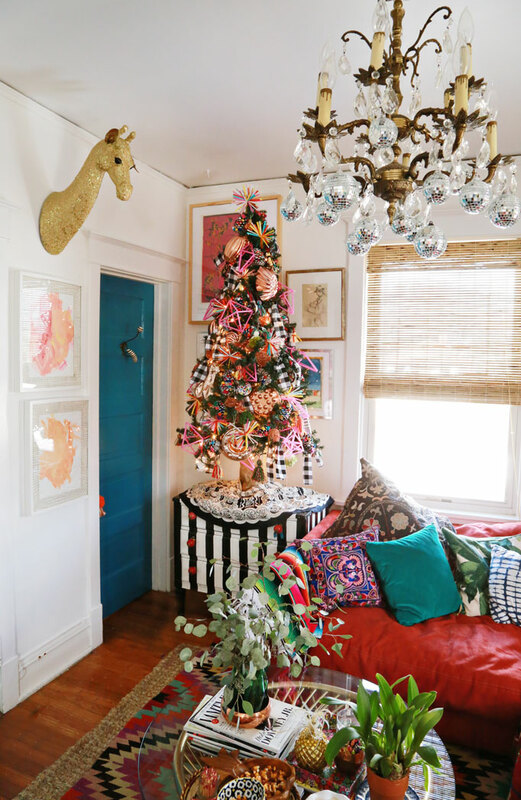 Prepare to be WOW-ed by the most amazing, fun, whimsical, colorful Christmas home you’ve ever seen! 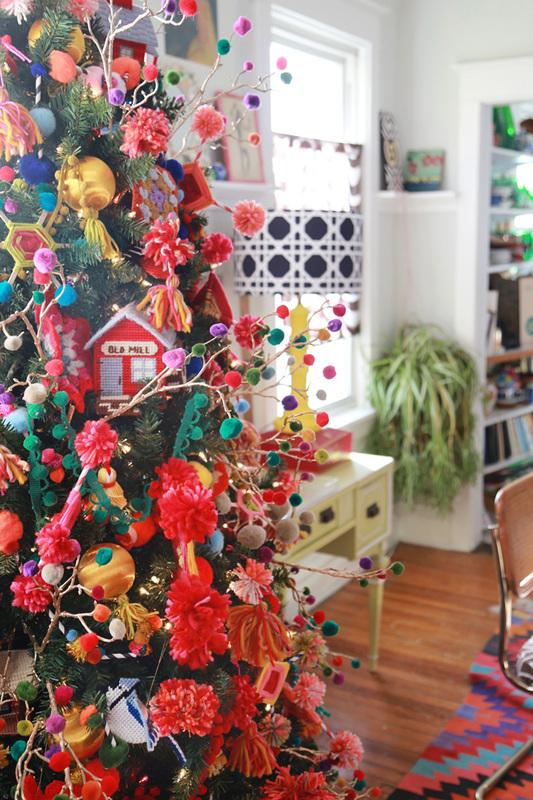 Amanda of Aunt Peaches knows Christmas trees – she’s decked more than 300 trees for herself and clients. 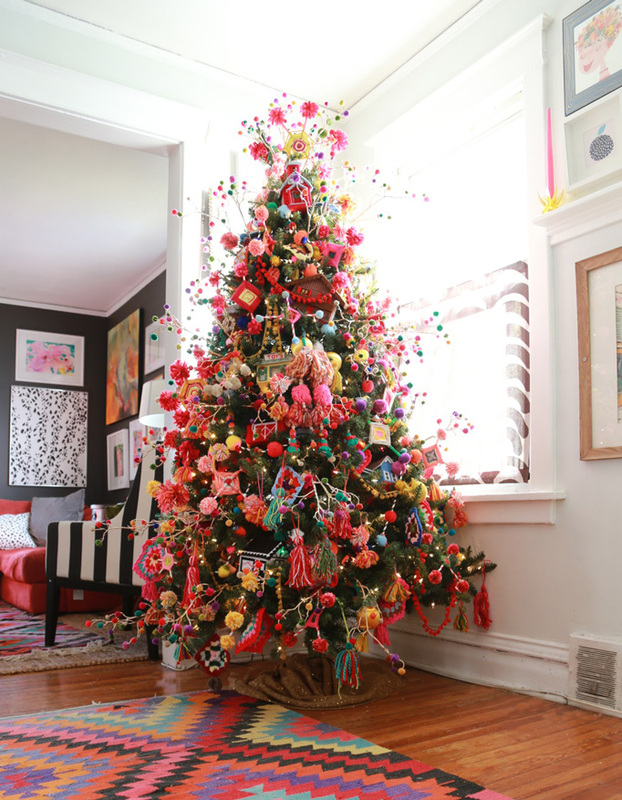 She adds “frosting” to her trees – the things that stick out and add dimension to a tree so it’s not a big boring triangle. 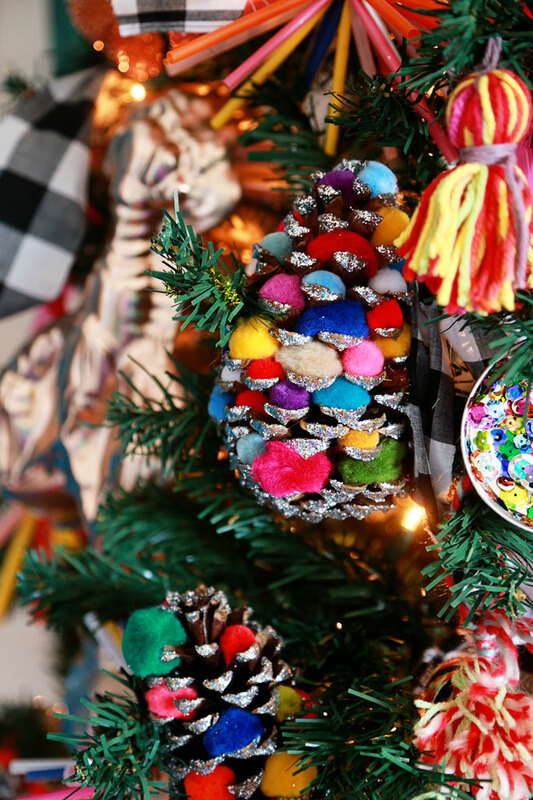 This tree is extra special because every single thing on it is handmade from the pom pom branches to the yarn tassels to the cute embroidered houses. 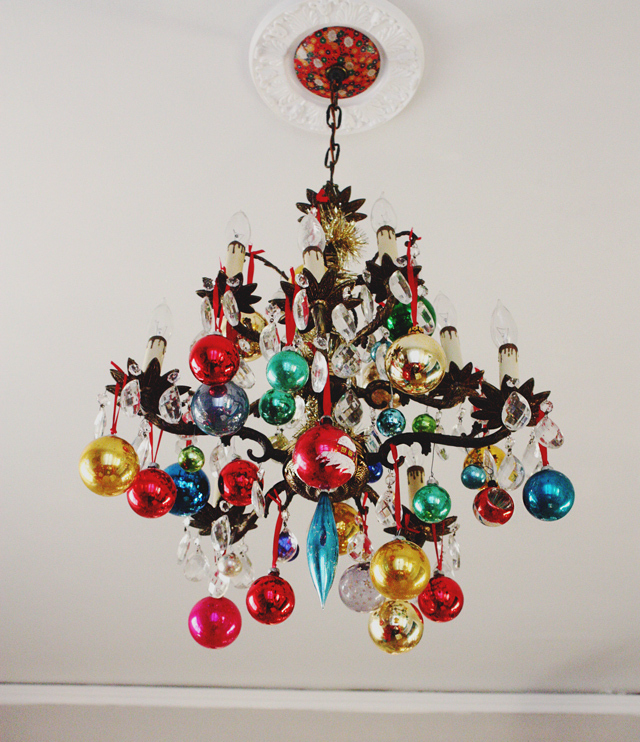 Not even the chandelier is safe from a little bit of Christmas! 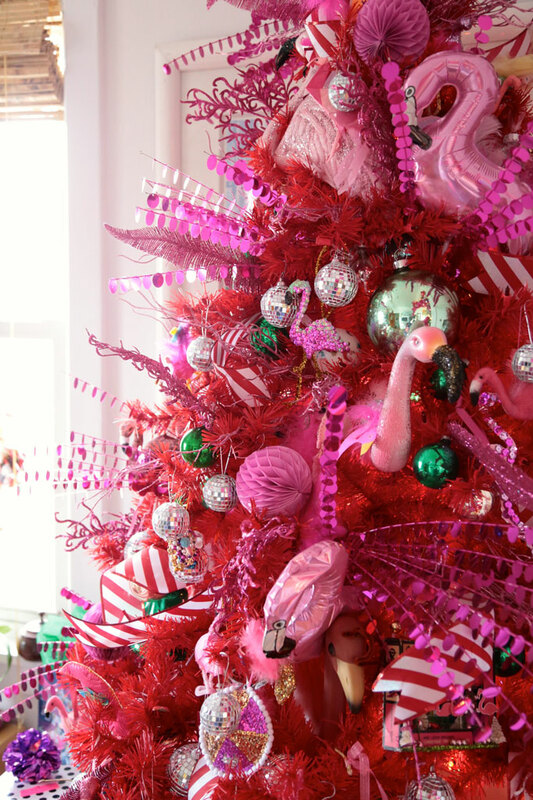 How fun is this pink flamingo tree surrounded by hand painted gift bags. Can you believe this tree skirt is an actual skirt from her closet. 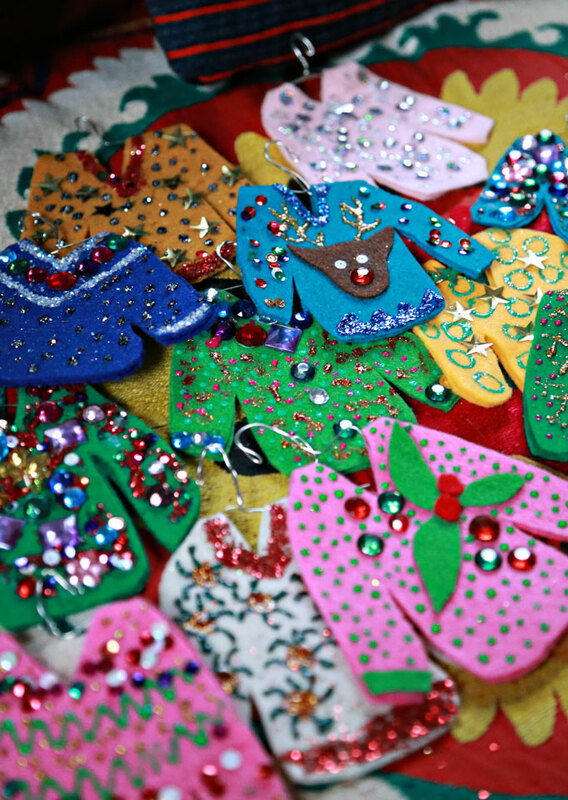 A batch of ugly sweater ornaments waiting to be hung. Amanda’s creativity doesn’t end when Santa goes back to the North Pole. 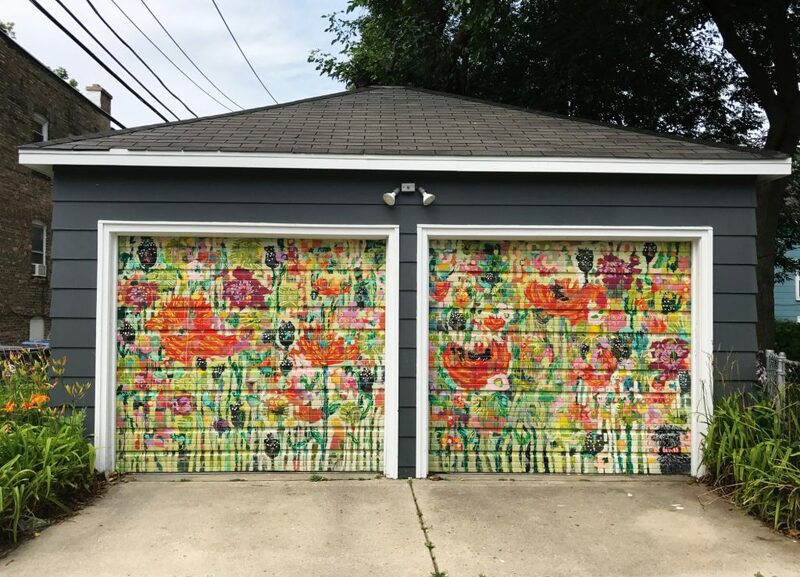 She added her artistic touch to her garage doors. Visit Aunt Peaches to see more of her creativity and craftiness. Wow wow wow – loved it all. The colour and the bravery to do something unique & exciting as this !! & kudos to you & your creativity ❤️❤️❤️? Suzy you couldn’t have said it any better! How absolutely and utterly delightful! Delightful is the perfect word Rebecca! What a fun house!! Love it. Makes you rethink traditional decorating. I bet the fluffy cat had fun exploring the Christmas tree!! Wow. Now that is called “HAPPY”….Love it. I decorate a nail shop for my friend and I think I’ll do something along those lines for next year! She has nail polish in all of Aunt Peaches colors!!!!! I would love to get a mani/pedi surrounded by all that color! WOW, Amanda loves color! Fun! Santa is putting her on the nice list! 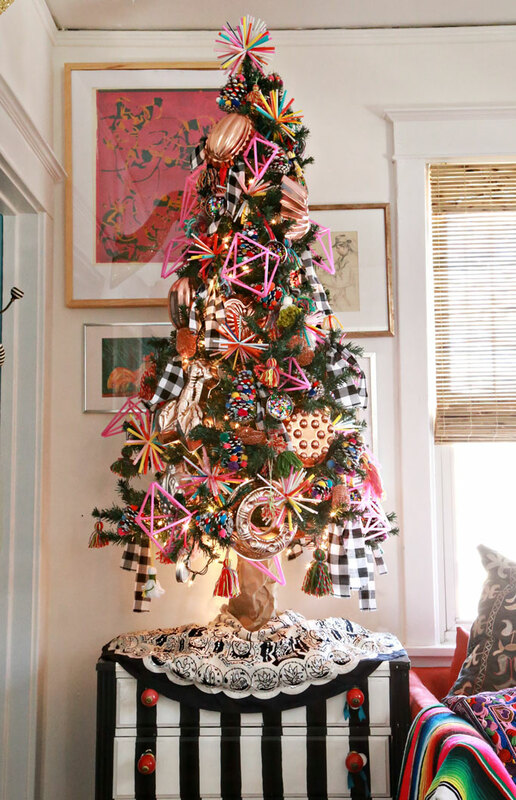 i would say these are the most fun christmas trees EVAH! Wow! Makes my house look so bland. I would love to see this house minus the Christmas decor. 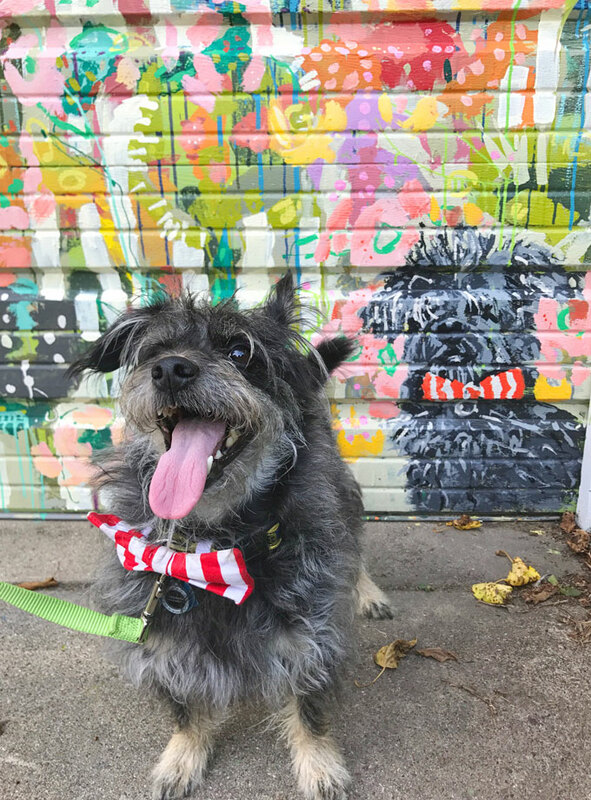 Me too – she has such colorful style! Original, creative, so much fun, love it!!! I’ve been familiar with Aunt Peaches’ gobsmacking vintage Christmas Wreaths, but THIS is a surprise. 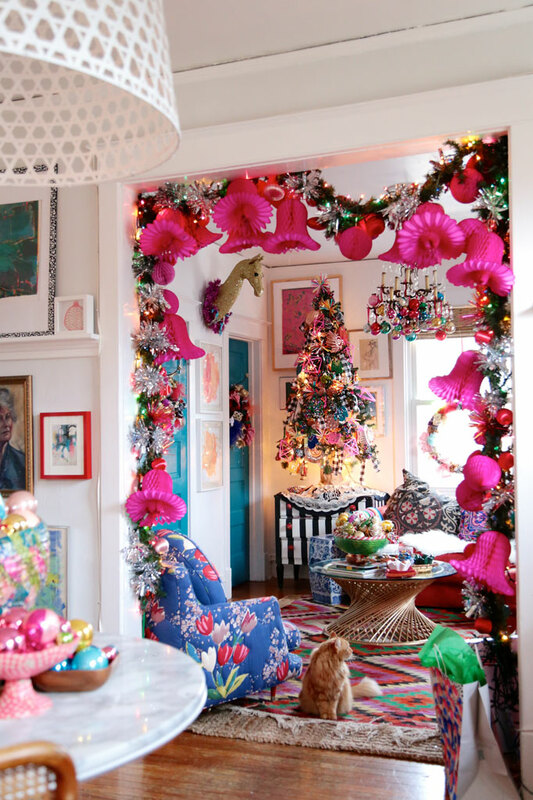 I think it’s so festive, whimsical and cheerful! 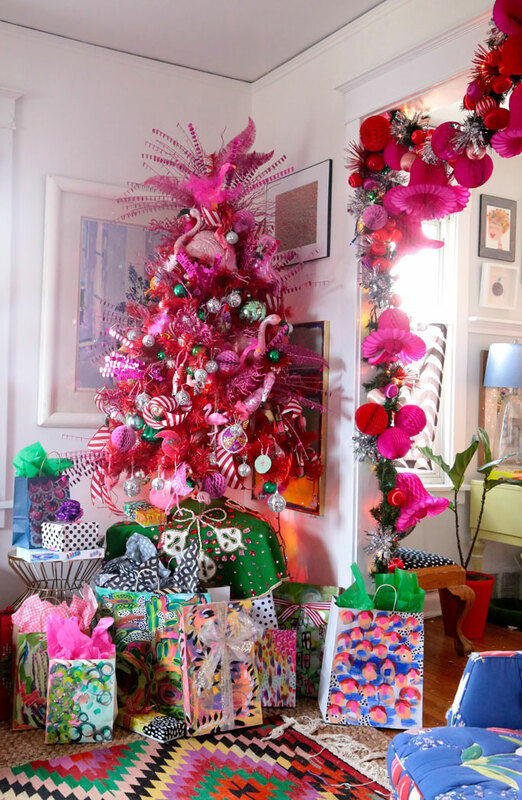 I am a lover of the eclectic style of decorating, but as much fun as Aunt Peaches decorations are, I could not choose this in our home for Christmas. 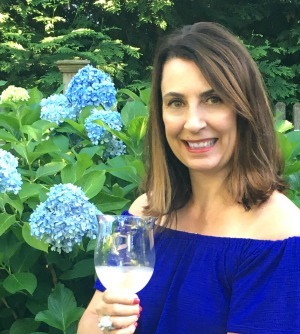 Thanks for sharing, I had a delightful time! 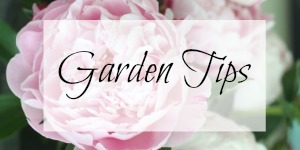 I love that we can pick and choose little details from every home tour to make it our own! I think you could spend an hour or two, or three, just studying each tree and each vignette. 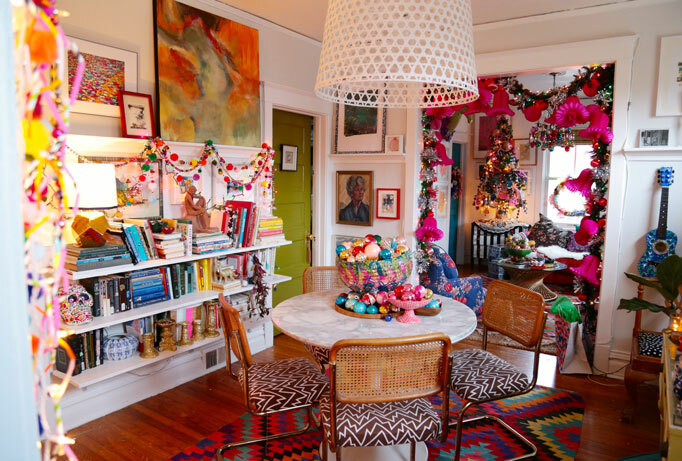 This is my kind of decorator…not only willing to use color but also to use it in her own house! 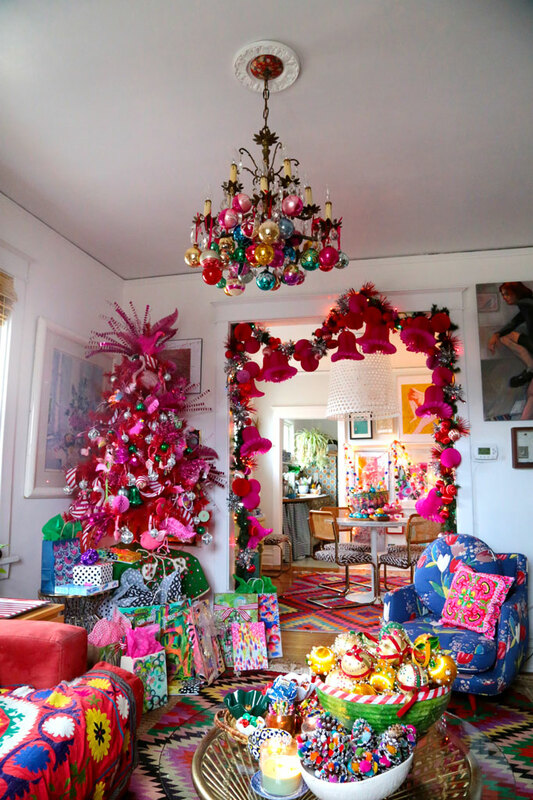 Agree – she is not afraid of color and it look amazing! 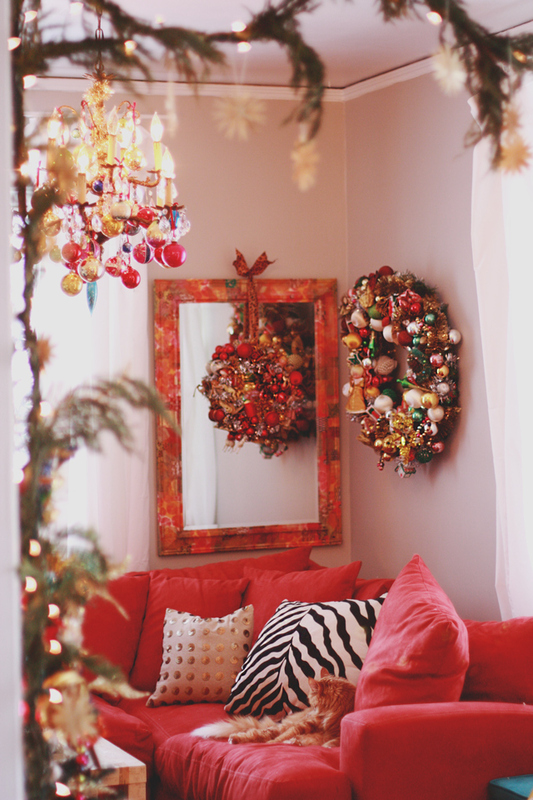 Prettiest Christmas house tour on the internet. 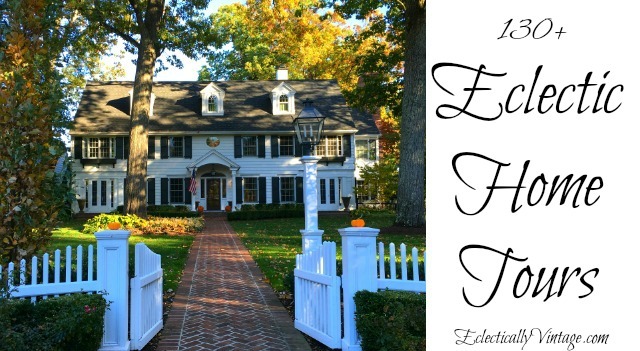 It’s definitely a favorite – so whimsical!